Farangas is a beautiful sandy beach we met on the way to Alyki and it is 14 km away from Parikia. 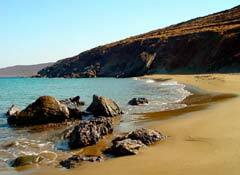 Before you reach Farangas you’ll see several small quiet beaches. All of those are very beautiful and characterized from their clean waters. Among them, Farangas is the most popular. The road is not so good (not asphalt) but it’s worth your while.